The fact that in OSL we have the incidence vector I available has proven its utility already in the many cool toon and carpaint shaders people have implemented. 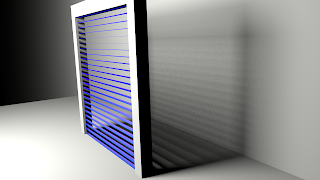 In this article we take this concept a bit further and create a shader that does not change it lighting model as a function of the angle between incidence vector and normal but changes its complete behavior depending on the angle between incidence vector an object orientation, allowing us the model a 3D-object (Venetian blinds) with just a 2D-tecture. The idea of providing a different image based on the viewing angle is not new and is fact readily available in traditional media under the name Lenticular printing. But in OSL we are able to act on any incidence vector, not just the one from the camera. This means for example that shadow rays act as they should and that we can make our material transparent in places to let it cast correct shadows. 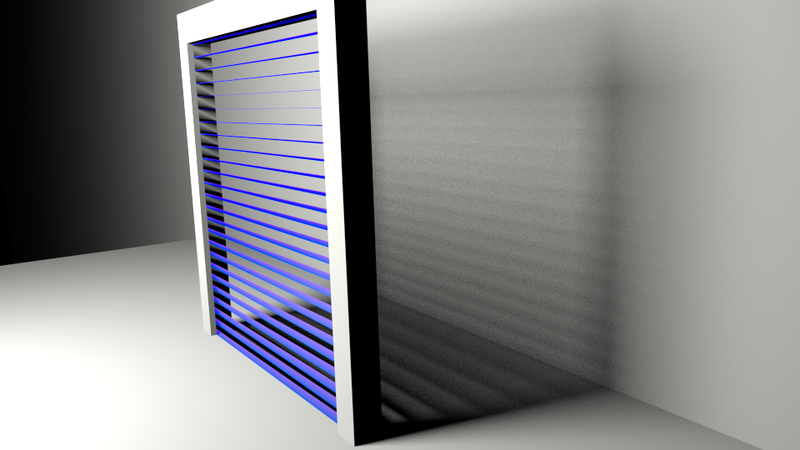 In the sample image and in the video we used this trick to render venetian blinds as seen from different position with just s single plane. The node setup used to render both the still and the video looks like this: This material is applied to a simple plane. The lighting consists of a single mesh light on the left.